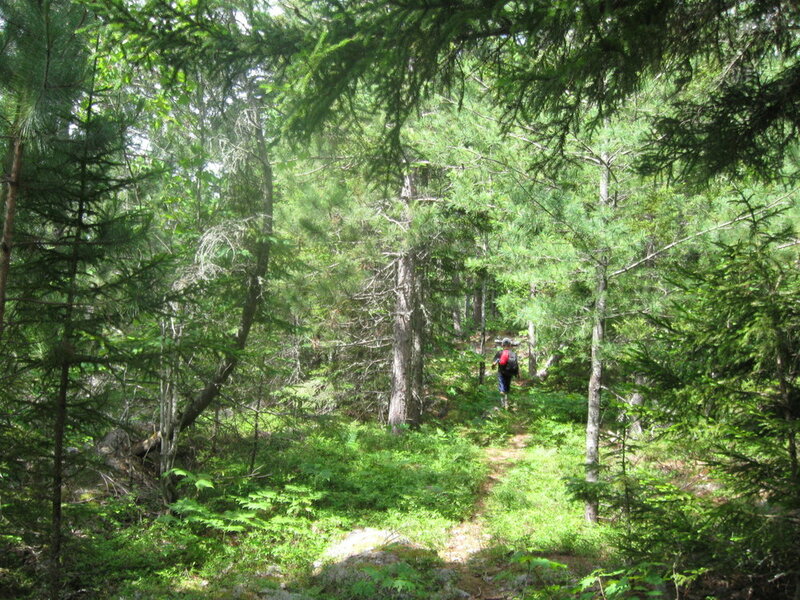 There’s a hike missing from Hiking Maine’s Baxter State Park. The guide includes all the trails in the park—except those in the Scientific Management Area. I had planned to include a three-day trip there that includes most of the trails in the area. 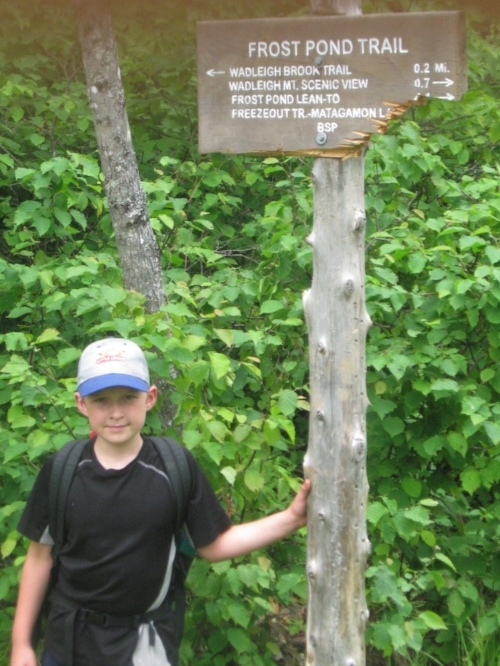 In 2010 my son Henry and I backpacked up the Wadleigh Brook Trail, across the Freezeout, and back on the Frost Pond Trail. It was his first backpacking trip (the trip is the part of Katahdin, Henry & Me that’s available on my website). I decided to rehike and map the trip with my daughter Emma for Hiking Maine’s Baxter State Park. The Wadleigh Brook Trail—even in August—was mostly under water. Seemed like the beavers had been busy. It was also the buggiest trip I’ve ever done. I didn’t feel comfortable including it in the book, but every time I pick up a copy of the book it feels incomplete to me. So, here’s the missing hike. Repeat it if you dare. The hike begins at the Wadleigh Brook Trailhead along the Tote Road 1.0 miles west of South Branch Road (and 8.0 miles from the Matagamon Gate). The Wadleigh Brook Trail follows Wadleigh Stream. For the first few miles the stream is out of view. The trail crosses several low ledges, wet mossy areas, and mature hardwood forests with an understory of ferns. Then it gets wet. The trail passes between Wadleigh Stream and a marsh. Both seem to have been enlarged by beavers. In several places, the trail is simply gone—you stand there looking across a shallow, tree-filled pond. In the distance in a tree with a blaze. Good luck keeping your feet dry. Eventually, the trail crosses the Wadleigh Mountain Road near the Blunder Pond picnic area. On the north side of the road, the trail skirts the edge of an area logged about 15 years ago. 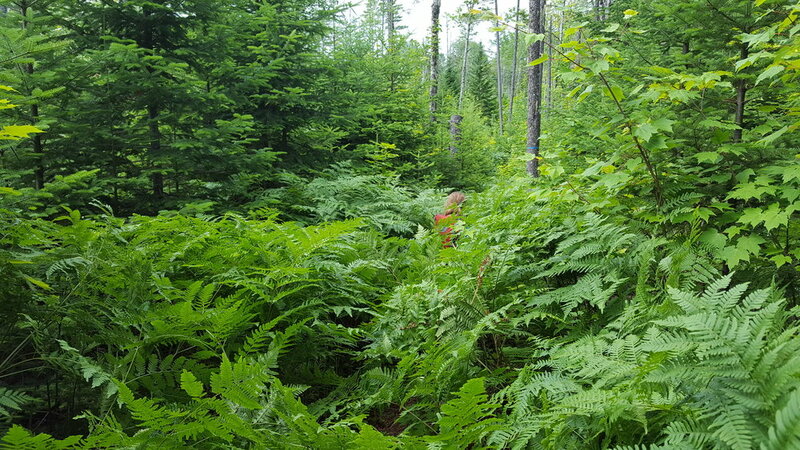 In places the trail is buried beneath ferns that grow four feet tall. Back in the woods, the trail skirts around two beaver flowages before reaching the east end of Hudson Pond. The Hudson Pond lean-to sits in a stand of mature hardwoods upslope from the pond. There’s a canoe for campers on the shore. Follow the Freezeout Trail east along the south shore of Webster Stream. The trail follows an old road that was used until 1960 when this area became part of the park. You’ll find corduroy logs in the west areas. In several places, the woods are littered with iron cables and the rusted remnants of tools. About a mile before you reach Grand Pitch, the trail drops away from the old roadbed—which bears southeast towards Trout Brook Farm. The stream quickens. The overgrown banks give way to black slate. You pass smaller falls and black sand beaches before reaching Grand Pitch. The falls are a roaring thirty foot drop broken by slate ledges and boulders. From there, it’s a short walk to the Little East lean-to at the confluence of Webster Stream and the East Branch of the Penobscot River. The third day begins with a walk along a roadbed that follows the shore of Grand Lake Matagamon. Turn off the Freezeout Trail and follow Frost Pond Trail west. The trail climbs gently, crossing a nasty wetland before reaching Frost Pond. There’s a lean-to in a stand of red pines just back from the shore. There’s a canoe, but it’s only for people who camp at the lean-to. 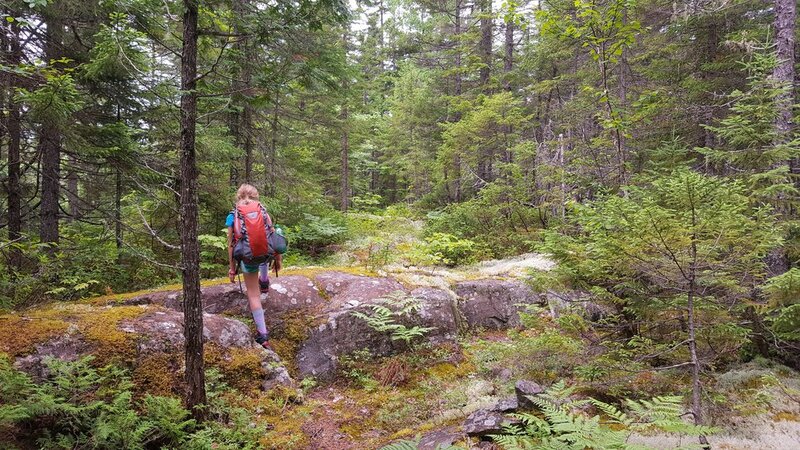 Past the pond, the trail crosses a series of rough ledges and skirts around a beaver flowage. You don’t seem to be gaining any elevation, but pretty soon you walk out onto Wadleigh Mountain’s long summit ridge. There are only partial views to the south. The summit ridge is rocky and dry, covered with twisted pines and scratchy lichen. Quite a change from the rest of the hike. The descent off the mountain is relatively steep. You drop back down into the swampy hardwood forest, cross a road and arrive back at the Wadleigh Brook Trail. It’s an easy 1.4 miles back to the trailhead. The entire hike is 25.3 miles. It is very remote. The fire rings at Little East had weeds growing in them. Not a lot of people visit this area. On the two hikes I’ve made here, I’ve seen lots of bear and moose sign. Henry and I found a kingfisher nest in the rocky bank of Webster Stream. Beavers are everywhere. If you’re willing to get wet feet and suffer bug bites, it’s a great escape. I took a picture of Henry crossing this same ledge six years earlier. 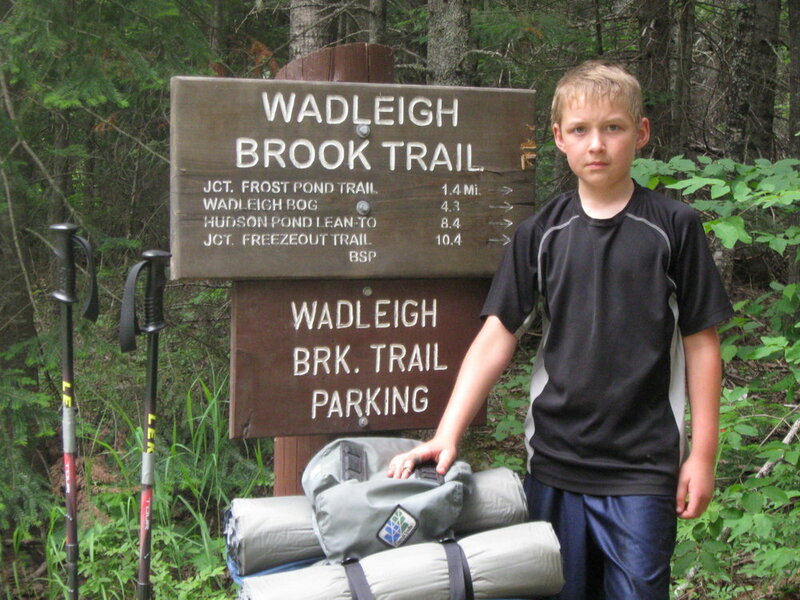 0.0 The Wadleigh Brook Trailhead is on the north side of the Tote Road 1.0 miles west of the bridge over Trout Brook. 1.4 Pass Frost Pond Trail. 3.5 Cross a beaver dam. 5.3 Arrive at Wadleigh Bog. 7.4 Cross Wadleigh Mountain Road. 8.3 The trail skirts around a beaver flowage. 8.7 Bear left toward Hudson Pond, which is visible through the trees. 9.0 Arrive at Hudson Pond Lean-to. Wadleigh Brook--notice the blackflies on Emma. 0.0 The Wadleigh BrookTrail leaves Hudson Pond and heads northwest towards Webster Stream. 2.0 Turn right onto the Freezeout Trail. OPTION: You can turn left and hike two miles to Webster Lake. There’s a lean-to at the end of the trail. 3.9 Pass Webster Stream lean-to. 6.7 The trail leaves the old roadbed and follows Webster Stream. 7.7 Arrive a Grand Pitch. 8.2 Arrive at Little East lean-to and campsites. 0.0 The day begins following an old roadbed along the shore of Grand Lake Matagamon. 1.6 Turn right onto Frost Pond Trial. 3.1 The trail climbs gently, crossing a nasty marsh before reaching Frost Pond. 4.4 Cross several rocky ledges and skirt around a beaver flowage. 6.1 Arrive at the summit of Wadleigh Mountain. 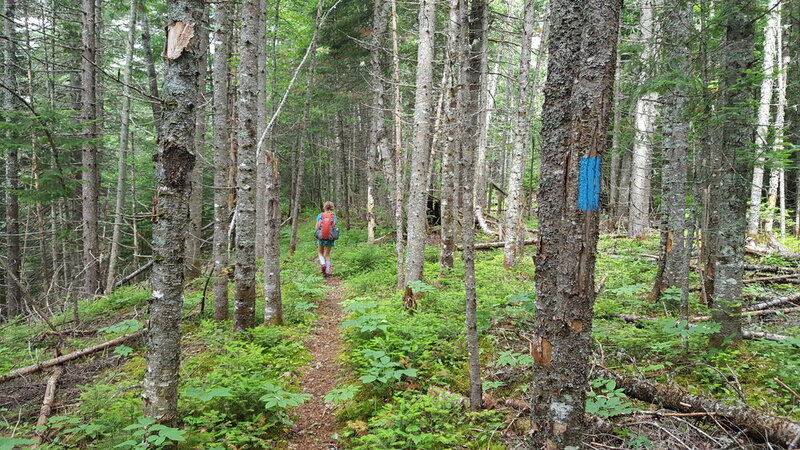 6.7 Descend steeply, cross a logging road, and arrive back at the Wadleigh Brook Trail. Turn left to return to the trailhead. 8.1 Arrive back at the trailhead.